Disclosure: This post may contain Amazon affiliate links. As an Amazon Associate I earn from qualifying purchases. Thank you for helping me keep the lights on! 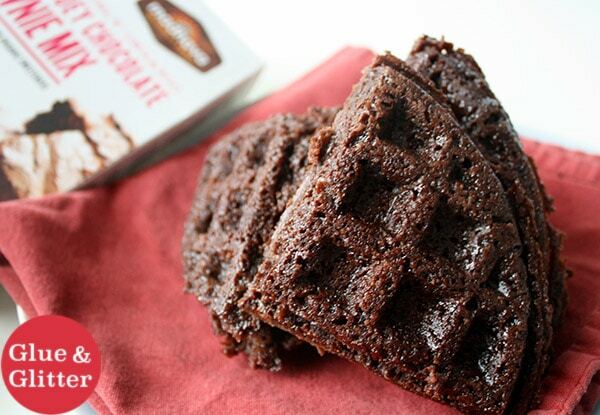 Turn your favorite boxed brownie mix into brownie waffles. No, really! The waffle iron experiments continue! These waffle iron brownies took some experimenting to nail down, but I finally have it. They’re super easy, because you make them with boxed brownie mix. These waffle iron brownies are pretty amazing, y’all. They’re crispy on the outside and fudgy on the inside. And the best part is that I made them with a mix! My awesome sponsors at Madhava sent me some boxes of their brownie mix to use, and I converted the recipe to a waffle recipe. 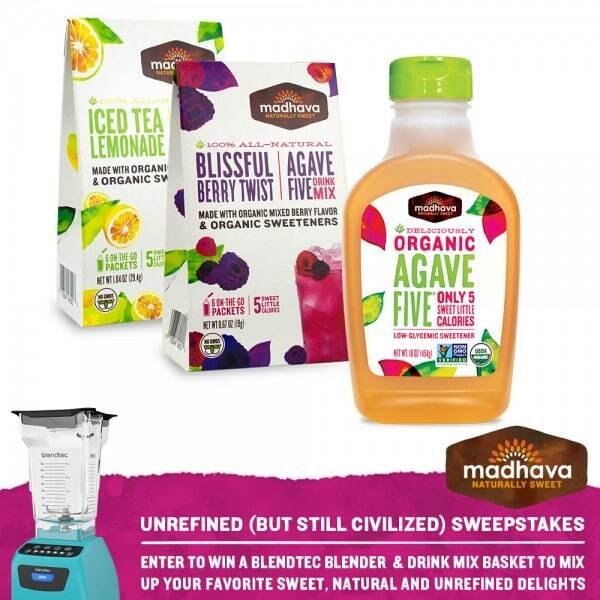 This month Madhava is running an “Unrefined (But Civilized)” contest, and you can win a Blendtec Blender and their AgaveFIVE® Drink Mixes! They’ll be announcing the winner on Monday, April 27, 2015. You can enter right here! 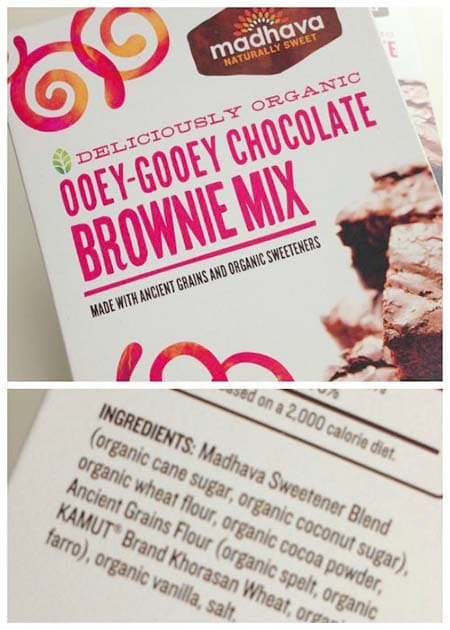 Some Madhava products contain honey, but a lot of their baking mixes are totally vegan. I’m new to this product, and it turns out they carry it at the Whole Foods near my house. You can bet that we’ll be making these brownie mix waffles again! So, on to this waffle situation. There are some things you need to know. I looked at a few other recipe for brownie waffles as a jumping-off point, but you guys. They did not work for me at all. The recipe below worked great for me, but waffle irons can vary a bit. Your waffles may need to cook for more or less time, depending on the size waffle your iron makes. More on that below. And this is the waffle iron that we use, for reference. My waffle iron takes about five minutes to make a regular waffle on medium high, and the brownies took about 10 minutes on medium high. If your iron cooks faster, your brownies may not need to cook for quite as long as mine did. Doubling the cooking time seemed to do the trick for me. The other thing that you need to know is that this recipe makes a bit of a mess. I would recommend sticking a clean hand towel under your waffle iron to catch any oil or mix that spills over. The first time I tried this, there was oil all. over. my. counter. It’s less messy with the lower oil version that I landed on, but there’s still some overflow. It’s the nature of the beast. Think of it as naturally reducing the amount of fat in the finished waffles, making this practically like eating broccoli. Wait! There is one last thing. The recipe says to let the waffle cool before you gently work it out of the iron. Do not skip this step. Your waffle iron brownies will 100 percent fall apart if you don’t let them cool. Waiting is hard when there’s chocolate to eat, and I ruined a couple of waffle iron brownies by trying to get them out too soon. Learn from my over-eager mistake! I think that’s all you need to know! Let’s make some brownies in the waffle iron, y’all! 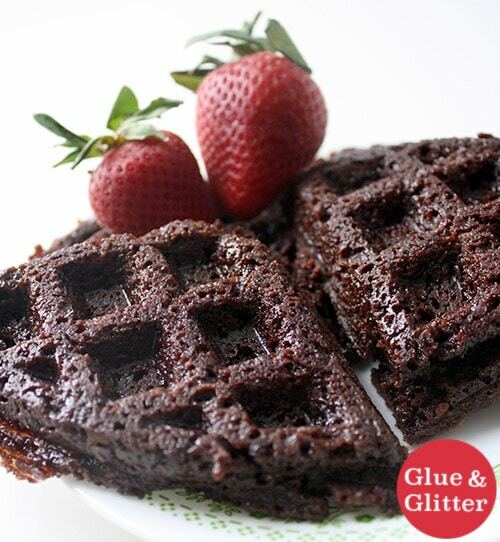 This recipe makes about 2 batches, so around 8 little triangular brownie waffles – 1/4 of a waffle is 1 serving. Each round takes about 25 minutes. 1 can white beans – drained, liquid reserved. You can set those beans aside, because we are done with them! Preheat the waffle iron to medium high. Cream together 6 tablespoons of the reserved bean liquid with the margarine. You can discard any leftover bean liquid or save it for another recipe. Add the brownie mix, mixing until you’ve got a nice, uniform batter. It’s going to be very thick, because we left out all of the water and cut back on the fat that the mix calls for. That’s what you want! Use a silicone spatula to spread 1/3 cup of the waffle mix into each section of your waffle iron, and press the iron closed. The batter should pretty much fill up the bottom half of the iron. Let your brownies cook for 10 minutes, then open and turn off the waffle iron. Let them cool in the iron for at least 5 more minutes before gently flipping them onto a plate with a paper towel or clean kitchen towel on it. You may need to use a fork to nudge your waffle out of the iron. I had the best success here when I actually flipped my cooled iron upside down and nudged the brownie onto its plate. Start by unsticking all of the sides, then ease it out of there. Eat your waffle iron brownies immediately. You can try storing them in an airtight container, but mine did not store super well. I’m sorry to burden you with eating a lot of chocolate. If you want more brownie waffles, heat up the iron again, and make that second batch. You can keep this mix in the fridge for up to three days. Just let it come to room temperature before you make the next batch of waffle iron brownies. 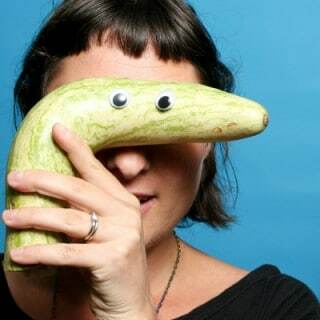 Becky Striepe (rhymes with “sleepy”) is a vegan food writer and cookbook author. She been vegan since 2006 and developing simple vegan recipes since 2008. It looks very nice, I like it. Thanks! Great recipe idea !